Coming out of summer, more people are also at work and not struck down by the winter illnesses that tend to sweep through workplaces and classrooms. The weather is still decent so people are less likely to be put off walking/waiting for services. That last point is important because if people try PT and it works well, they’re more likely to keep using it later in the year. If instead they find buses and trains too busy to get on, caught in congestion they’ll be much more likely to give up and go back to driving. To highlight just how much busier March tends to be compared to other months, this graph shows March coloured red. You can also see it in these graphs from Auckland Transport’s monthly indicators showing the average boardings on business days. March last year saw almost 250k people a day on buses and over 70k per day on trains. For many years now we’ve repeatedly asked the question of whether AT is ready for March and every year, once March hits, they’ve been caught short and images of full buses and trains are a regular occurrence. Some people have reported in the past of up to 12 buses passing them before one turned up that they could get on. Often AT have capacity improvements planned but they’re not due to be implemented till after March which defeats the purpose. Last year things were so bad that AT got operators to pull out every old dunger of a bus they had hiding out the back of their depots just to try and meet demand. So, will this year be any different? Positively, while I expect March will continue to be busy and put pressure on bus and train capacity, I think there’s a greater chance than ever of getting a good result. That’s because AT appear to be learning and have been adding capacity *ahead* of March. Auckland Transport is putting on more services to meet passenger demand during March. Mr Main says last March some peak time trips were crowded and these are the services being targeted with extra buses this year. Bus capacity has increased by close to 5400 spaces and timetable changes for trains from 12 March will mean an additional 1200 spaces are available in the morning peak. Mr Main says double-decker buses are also coming to Birkenhead to help with the demand. From next Monday, 27 February, four double-decker buses will commence services on routes between Beach Haven, Glenfield and the central city providing much needed additional capacity along Onewa Road. New routes for double-decker services are 970, 973, 973B, 974 and 974B between Beach Haven and the CBD and the section of routes 950 and 955 between Glenfield Mall and the CBD. Here is where the additional capacity has been added, most of occurring late last year which is likely why, for me at least, February doesn’t feel to have had the same trouble indicators as previous years. AT also say that the change to the rail timetable on 12-March will see 1,194 spaces inbound during the morning peak, split between the Eastern Line (796 spaces) and Southern Line (398 spaces). 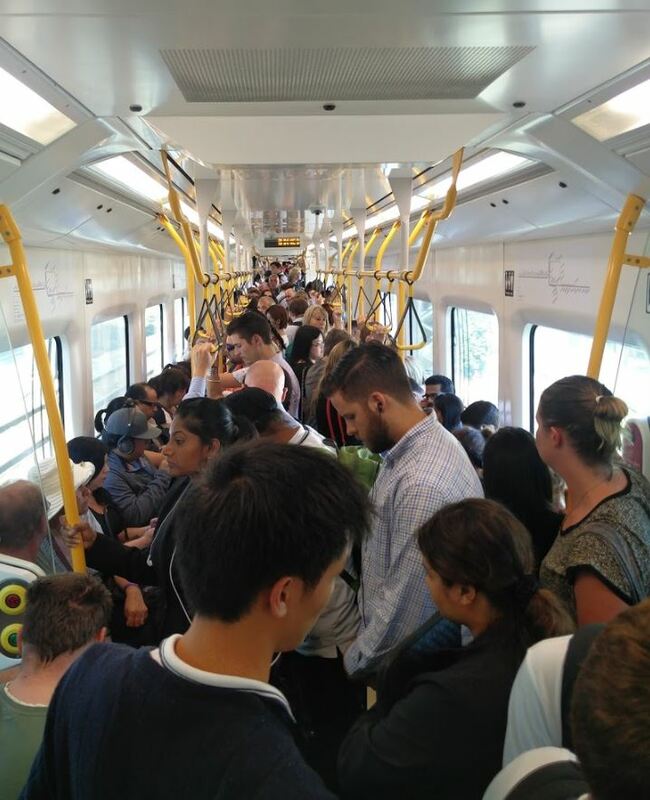 The western line had a capacity boost last year when it moved to 10-minute peak frequencies and the services I catch have been busy but not crushingly so. The table AT provided raises a few other interesting aspects. In March last year, Dominion Rd and the Northern Busway had similar levels of capacity but my understanding is that ridership is notably higher on the Northern Express. You can also see the impact that the double deckers have on operations. Both routes had capacity for just over 4,000 people but the NEX did that with 43 buses compared to 63 buses on Dominion Rd. That means Dominion Rd needs additional drivers and buses to move the same number of people and with so many buses down the corridor, on which the bus lanes aren’t continuous, it can lead lots of issues of bunching, slow services and ultimately a worse experience for passengers. This is ultimately why AT want to put Light Rail down Dominion Rd but given that’s some time away, they really need to improve the bus lanes now and that could also help reduce operational costs. Given many of these services have been in place for a few months, they will already be reflected in the very peaky nature of our services. Let’s hope that this year services handle the PT pilgrimage better than they have in the past and we don’t have people being left behind. Well, it would be nice to think so, but realistically…. you know what the answer will be. I’d guess that 6:30-9:30 or even 6-9 would probably encompass a greater number of commuters than 7-10! No, there are very few PT users before 7am, it ramps up very quickly between 7 and 7:30. It varys depending on the route of course, but on the rail network for example you have about four times as many people boarding between 9am and 10am as you do between 6am and 7am. I think JDELH was specifically meaning ‘commuters’ as in people going to work, and he is probably right on that. But there is an inherent value statement in his argument that only commuters count, whether it was intended or not. That might be partly a factor of low frequencies before 7. It’d probably be worth trialling higher early frequencies and see what the uptake is like, and if it’s good, think about starting bus lane hours earlier. I have a theory that a non-negligible number of students are price-sensitive enough to go in to uni early if there were a) reasonably frequent services and b) an off-peak discount. The trains run at ten minute peak headways from about 5:45am, so that isn’t a factor. Nick R – Not on the Western Line, and you’re SOL if you need a bus transfer at either end. But actually the differential between Western and (inner) Southern Lines would make an interesting test: are early morning volumes any higher on the inner Southern line than the inner Western Line? If yes, it suggests there is suppressed demand. You’re right – it would be great news to have a quantum leap in PT like their figures imply they will. When it is all done, and opened along with Transmission Gully, we’ll have even more cars coming into town, and it will be even harder for PT to cope, and to be honest, we’ll have even more congestion, as we don’t have an overall organisation like AT. So: jealous of Auckland’s judicious increase in Public Transport! Guy, other than the government’s wrongheaded priorities, which are nationwide, I can’t help feeling that Wellington suffers from the idea that it’s got ‘great PT’ , the ‘nation’s best’, etc. Up here AT have the constant pressure of the opposite general impression. Neither reputation, in my view, is entirely accurate, some of AT’s service are great, and some areas in WGTN get crap service. I just wonder if there is some complacency in PT provision in the capital…? Buslanes, service span and frequencies look to me like they could improve, even network design. Worse still in WGTN is a lack of separate bike infra (despite riders in numbers), and pedestrian amenity, especially the crossing cycles that feel like they were set by some drunk traffic engineer in the 70s who had never seen a person on foot…. I love Welly, but you are right to be getting a little envious, the slumbering giant is waking and might come and steal your city’s urban crown! the capital is obsessed with ‘4 lanes to the planes’. nothing else seems to matter. very depressing. Luke, its a little unfair to say “the capital” is obsessed about 4 lanes to the planes – it’s worth pointing out that the mayoral candidates who campaigned on exactly this issue (Jo Coughlan and Nick Leggett) got very few votes, were not voted in as Mayor, are not in Council, and have largely disappeared from view. Alternatively, if you mean Mr Steven Joyce, as big and very important as he is, he is not exactly the entire capital, and I believe he lives in Auckland. Honestly – I think that not many – if any – Wellingtonians are obsessed about 4 lanes to the planes. Some people, mainly from Kapiti coast etc way north of Wellington, may think that way. But the rest of us? No. good point. i just see a pile of roads getting rammed down and it saddens me. Accurate assessment Guy. Wellington is having this Levin-Airport 4-lanes policy foisted on it, in full glare of the increased traffic problems it will produce in the city. Kapiti is basking in the euphoria of its Expressway-opening, which is very much a case of ‘pushing the traffic-problem down the road so someone else can deal with it’, (and worsening it in the process). Of great concern are official predictions that 25% of patronage is likely to be abstracted from the Kapiti rail-service because of these motorway projects. Wellington urgently needs to pause and take-stock, instead of mindlessly bulldozing on with the likes of Transmission Gully. As things stand, this wonderful region is undergoing a radical transformation. . . . , but in the completely wrong direction. Dead right Luke. It’s depressing! Patrick – mainly, sadly, absolutely right. There is not just some complacency, but also incompetence, and our problem is that the Greater Wellington Regional Council has a stranglehold over PT in the region. I’ve (seriously) not met a single person who thinks that GWRC are doing a good job, and they move at a pace that is less than glacial. I’m not too worried about whether Auckland comes and steals our crown – if Auckland keeps improving then that is wonderful news – but at present, and for the foreseeable future, Wellington will be focusing on making buildings more quake resistant, and paying little attention to things like bike lanes and pedestrian cycles. Those are our real problems! It may explain some things however. I mean, GWRC are onto their 3rd building now, their previous two are both quake prone and have had to be abandoned. I’m not even sure where GWRC actually are now. Perhaps they are all working from home. But their lack of a functioning building may well be having a strong effect on their performance…. Definitely an element of truth there – and frustrating given that in Wellington we don’t have integrated ticketing, we still get penalized for transfers on journeys, and our train services inefficiently require staff on board to clip tickets. We’ve got some great services here in Wellington, but we can (and should) be doing so much better. And progress on PT here is moving at snail’s pace. In the case of the electric buses, we’re moving backwards by heading to diesel. Birkenhead Transport now have a single double decker, maybe more are on the way and going by the Howick and Eastern DD there yesterday and a GoBus tandem axle single decker maybe there is some co-operation amongst the companies in respect of their buses. I’m guessing Train Capacity is through 6-carriage train for most if not all peak hour trains? or are they planning on adding extra frequency services? Given they only have finite train resources, 57 x 3 car EMU’s of which not all are in use at once owing to maintenance, I wonder how much more capacity rail can provide. upgrading a few 3-cars to six car, there are no more slots at Britomart at the parks, and won’t be till the CRL opens. What can be done before then is all 6-car of the three main lines at peak. And peak frequencies spreading to the shoulders, and lifting throughout the rest of day and nights. Isn’t that Ricardo on the bus? Thank goodness I only live 2-3 kilometres from work. Can’t wait for increased services and DD around Birkenhead. Already in February the morning buses were full and unable to pick-up passengers – the 974 was full from Waipa Street and unable to pick-up passengers waiting on Mokoia and Onewa Rds. But AT also need to enforce the T3 on Onewa Rd – otherwise all this effort to meet demand will be wasted when the buses get stuck in traffic in the T3 caused by motorists ignoring the T3 rule. Road past Onewa today, and noticed scrum of people waiting for bus near the BP station. So looks like they are already overly full. Concern I have about March madness, is that there has been a bunch of growth since last year.. so potentially they are still underestimating the demand. As a regular train user on the Western line I’ve been shocked at the lack of people on the train. Despite catching the train in the evening peak I’ve only had to stand twice in the last month. It will be interesting to see how the existing capacity handles March madness. Shocked you say. One would hope that there is still space on a fleet of trains purchased only a couple of years ago, given we are growing at 20 % a year. It would have been poor planning had they been completely full from day one. R M – Why shocked? I am continually shocked at the number of cars on the northern motorway with only one person in them. Luckily it seems to usually be the driver but the damn things take up so much expensive space compared with the full bus I am on………………………..! We all know as owners of motor cars, that as a fast means of travel in the city, they are victims of their own success. How about this for a political solution. A new task for the navy. Send a frigate out into the Hauraki Gulf to sink every car carrier before it has a chance to disgorge yet another 500 odd cars onto our already clogged roads. Might slow things down for a while?!!!! Shocked because having been an active user on Transport blog for some years I know that PT numbers have been going through the roof. I’ve also traveled and am yet to come across any city in the world where rush hour has such little train traffic. University students or not. RM – ‘where rush hour has such little train traffic’ On the basis of this methinks we better build a few more railways to get the train traffic up as a percentage of our commuter usage!! Curious. I catch the 4:34 and it’s standing room only from Newmarket, and full (but not crush) from Grafton. Ditto for the 7:05 morning train, standing room only from New Lynn and full from Morningside. My morning train is well after yours and evening train between 5:00-5:30pm. Perhaps the Western line has a different peak period to rush hour? Rush hour is the time it arrives or departs at the city end. If you catch a train at Henderson at 8:20, it’s not rush hour anymore. Likewise departing Newmarket at 5:30pm, rush hour is almost done already. Spreading the rush ‘hour’ into the shoulders is the main capacity opportunity on the rail network until CRL opens, once all three main lines run 6-car sets at the peaks. This ought to happen naturally so long as the frequency and capacity doesn’t fall off quickly as that will prevent any such spread. Demand is created in part by supply; no-one can get a train that isn’t there. PS: This is to say, of course, that ‘demand’ is a limited word for how people choose to travel, we don’t get to demand a service, we only get to respond to what is available, we select a way to move from the available options. Transport demand by mode is not an objective number, it is a shaped or created, and therefore highly dynamic one. TRM – if you are leaving Britomart between 5 and 5:30pm you will likely be on a 6-car train. As I said above it would be very concerning if they were already chocker only 3-years after purchase, if that was the case you would probably be on here being critical of AT for not planning ahead for future growth. We are supposed to be excited about a further 3 buses on Gt. North Road, which will just sit in traffic between Avondale and the motorway. I catch a Gt. North Road bus every day and it take more than a hour to get from New Lynn to the CBD. Just pathetic. AT has a billion dollar budget do they not, why don’t they use it! I’m doubtful that the increased frequency of trains on the Western line will be enough for the morning commute. I feel like it already gets pretty full in the mornings. I’m not sure what AT can do about it, though, if increased frequency isn’t an option, and the trains at peak are largely 6 car already. I’d be more worried out west about what it is going to be like when work begins on the Mt Eden junction for the CRL, they will likely have to reduce frequencies during construction. Indeed. Maybe they will install a temporary or permanent bypass line to allow work to proceed uninterrupted without delays to normal rail services. Looks liket there is plenty of room to do that. There was a document that Matt wrote a post on here a while ago (I can’t find the link unfortunately) that if my memory is right said they would be going down to one track through the site. This I imagine would restrict frequencies to maybe every 20 mins? Hmm, depends on how long the single track section is. Twenty minutes headway given ten minutes less signal change time (say two minutes) to traverse the pinch point. You might still keep ten minute headways in the peak direction for a while if it is short enough. Although its years away, I hope AT sorts this out as single track through Mt Eden will likely end up a disaster even if it is only for a few weeks. Lots of time to organise another track. And probably a few loops and signalling for express trains.. and the Mt Roskill spur.. and Wiatakere, Kumeu, Haupai with those DMUs. A lot could be sorted out in the next 5-6 years for a fraction of the EW link road cost that the next govt will be cancelling. Parts of the network with extra services etc may cope better. Those that are currently crap will be worse because of increased dwell times due to larger passenger volumes. I caught a bus from Smales to Takapuna this afternoon and the first three services on the display board were late. The one I caught 8 mins; the supposed one before it 20 minutes and the third one had not showed when I left. None of this is encouraging for customers. Let’s have AT report actual running times and let’s have them report those results every month again so that they can be held accountable. Time for another letter to my local Board member. You are a passenger when you catch a bus. I’ve heard that the wheels go round and round.